U.S. withdrawal from Syria: Putin said he agreed with U.S. President Donald Trump’s assertion that the Islamic State has been largely defeated in Syria while cautioning that the terrorist group remains dangerous. He approved of President Trump’s decision to withdraw U.S. forces from Syria. “Is the presence of American troops required there? I do not think it is. However, let us not forget that their presence, the presence of your troops, is illegitimate as it was not approved by a U.N. Security Council resolution,” Putin told American reporter Rachel Marsden. “The military contingent can only be there under a resolution of the UN Security Council or at the invitation of the legitimate Syrian Government. Russian troops were invited by the Syrian Government. The United States did not get either of these, so if they decide to withdraw their troops, it is the right decision,” he said. Ukraine: Putin accused Ukraine of causing the naval confrontation with Russian forces in the Kerch Strait last month with a deliberate “provocation” tied to Ukrainian President Petro Poroshenko’s re-election campaign. Putin snidely noted that Poroshenko’s approval ratings have improved since the Kerch Strait crisis and he is now in second place in the polls. “In this sense, yes, he probably achieved the goal. At the expense of the country’s interests, I believe. This is a bad way to boost ratings,” Putin said. Putin blamed the suffering of civilians in the Donbass region of eastern Ukraine, scene of a Russia-supported insurgency, on the Ukrainian government. “They imposed a total economic blockade of the territory they consider to be their own. They shoot at the people they consider to be their own citizens. People are killed there almost every day – peaceful civilians, by the way,” he said. Putin said efforts to resolve the situation in Donbass with force are “doomed to failure” and insisted Russia wants “peace and prosperity on the entire territory of Ukraine, including Donbass,” since Ukraine is a major trading partner of Russia. “As long as the Kiev corridors of power are peopled by Russophobes who do not understand the interests of their own people this abnormal situation will persist, regardless of who is in power at the Kremlin,” he charged, alluding to a Ukrainian reporter’s suggestion that relations between the two countries will never improve while Putin remains leader of Russia. Putin denied Russia has “annexed” the Crimean peninsula, claiming the Crimeans “came out and voted” to become part of his country instead of Ukraine. He claimed the international community has punished the people of Crimea with sanctions for making this decision. The Russian economy: Putin defended his economic policies at great length, rejecting criticism that some of his national projects are unreasonably expensive or unnecessary by insisting research breakthroughs and “transition to a new technological paradigm” must be Russia’s highest priorities. “Healthcare, education, research and human capital come first, since without them there is no way a breakthrough can be achieved,” he said. 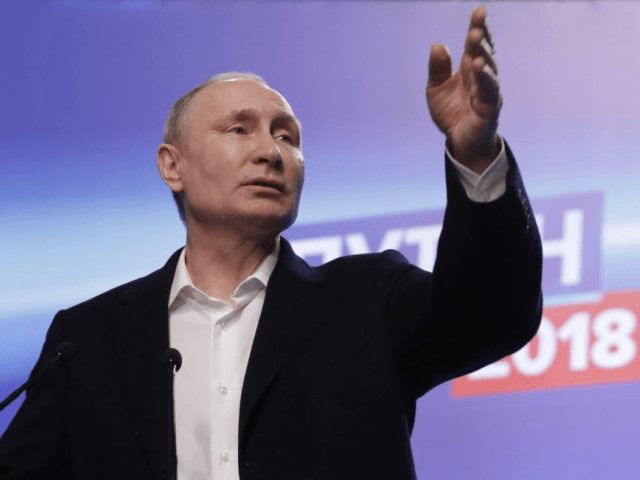 Putin admitted Russian economic growth has been sluggish but blamed other current and former officials, the 2009 economic crisis, and the 2014 collapse of oil prices rather than his own policies. He responded to many questions about the economy by insisting the quality of Russian life is improving or pointing to other countries where the standard of living is lower, using the massive demonstrations in France as an example. He portrayed a period of slow economic growth as the inevitable price of transforming the Russian economy for the next century and touted a projected budget surplus as good news, crediting increased commerce and investment sparked by a reduction in Russia’s value-added tax rate for increasing government revenue. U.S. sanctions: Putin denounced sanctions against Russia due to the chemical weapons attack on former spy Sergei Skripal as unfair and accused the United States of hypocrisy for failing to slap Saudi Arabia with similar sanctions over the death of Jamal Khashoggi. “Khashoggi was obviously murdered, and everyone acknowledged it. Skripal is alive, thank Heaven,” he said. He described U.S. sanctions as a “Russophobic” attempt to stymie his country’s economic growth. “Without the Skripal case, they would have come up with something else. This is quite obvious to me. Their only goal is to contain Russia and prevent it from emerging as a potential competitor. I do not see any other end to it,” he said. Putin was also unhappy with the U.S. prosecution of Maria Butina as a Russian agent of influence, accusing the Americans of forcing a confession from Butina. “I cannot understand what she could possibly have admitted since she was not following any instructions from the Russian Government or its agencies. I am saying this because I mean it, no matter what she says under the threat of being sentenced to 12 or 15 years in prison,” he said. Putin claimed Western governments fear Russia as a “mighty and powerful player” emerging on the world stage and search constantly for excuses to undermine its growing strength with sanctions. He said Russia’s economy has been negatively impacted by sanctions but praised its resilience. “Our economy, as it has been said many times, has adapted to these external restrictions. Look, in the beginning of this meeting I mentioned that after the 2008−2009 global crisis, our GDP dropped by 7.8 percent. There were no sanctions at the time. After the sanctions were imposed in 2014, the drop was 2.5 percent,” he boasted, while affecting concern for jobs lost in Europe due to the cost of sanctions against Russia. Putin claimed there are “positive sides to these sanctions” because they forced Russian industry to become more innovative. “The sanctions made us switch on our brains in many areas and Western experts also acknowledge this,” he said. Arms Control: Putin claimed the United States is pushing the world closer to nuclear war by accusing Russia of violating key arms-control agreements and threatening to withdraw from them. He claimed Russia was forced to develop new super-weapons after the United States withdrew from the Anti-Ballistic Missile (ABM) treaty and boasted Russian now possesses missile technology that cannot be matched by any other force in the world. He insisted Russia developed these weapons only for “deterrence” and preservation of the global strategic balance. Putin imagined the United States might deploy new missiles after withdrawing from the Intermediate-Range Nuclear Forces (INF) treaty or allowing the START III treaty to expire in 2021, which would oblige Russia to respond with more deployments of its own. “We will ensure our security. We know how to do it. But in general, for humanity, this is very bad, because this takes us to a very dangerous line,” he said. “There is a trend to lower the threshold for the use of nuclear weapons. There are plans to create low-impact nuclear charges, which translates to tactical rather than global use. Such ideas are coming from Western analysts who say it is okay to use such weapons. However, lowering the threshold can lead to a global nuclear disaster,” he added.